Since I've mostly done cards so far, I wanted to share another gift wrap idea. There were a lot of things I wanted to combine into this project. The final project, I think, might be a little over-the-top, but I still like it. I made the tag with the Festive Flurry stamp set (#131778 wood/#131781 clear) and matching Framelits (#132193). Head's up - Savings Alert! These stamps and Framelits also come together in a bundle at a 15% savings! (#133284 wood/#133285 clear) To see how I made the dimensional layered tag check out this video from Stampin' Up! 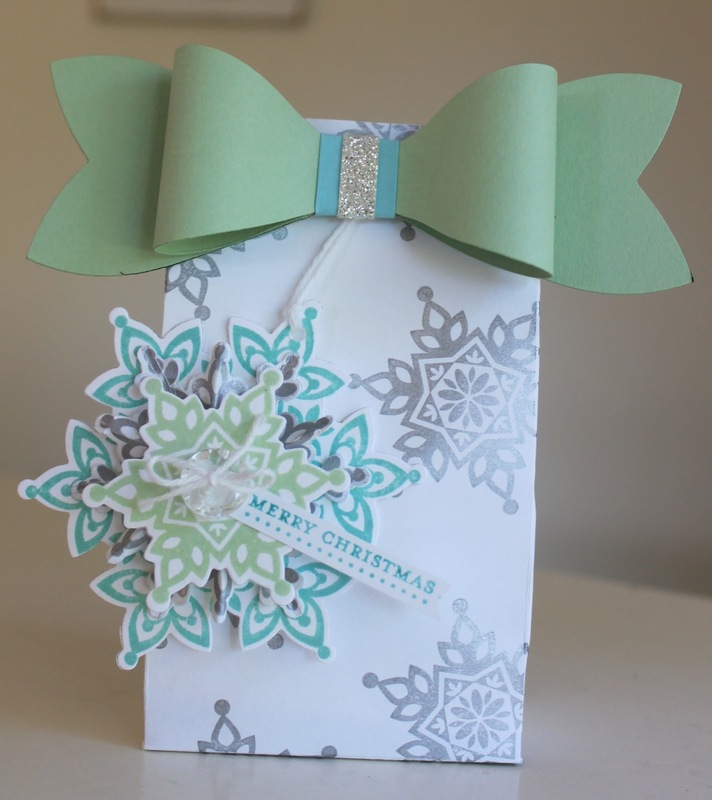 I also used a new die from the Holiday Catalog - this is definitely in my Top 3 Faves in the whole catalog! It's the Gift Bow Bigz Die (#129977) and it makes two sizes of these amazing paper bows. This is the smaller one. I'll do a video soon showing how to put them together, but it's really quite easy. This style of bow has been everywhere lately, and this die makes it so easy to create the perfect one. Just check out the dimension on this beauty! WOW! I'm pretty sure one of these is going to be on everything I give this Christmas. :) Love, LOVE this die!